Update 12/28/2018: Over the course of the last year, it has come to my attention that Rite Company has been kinda shady since the end of their Kickstarter and Indiegogo campaigns. Backers have commented, emailed, and messaged me saying they are 8+ months past their promised delivery date with zero communication from Rite Company. Other backers have mentioned when they did receive their Rite Press, it was not the stainless steel version they were promised, rather a plastic version that was hardly worth the amount they backed it for. I know running a business and producing a product is difficult, so I wanted to give Rite Company the benefit of the doubt and give them a chance to respond. Despite multiple attempts, I have heard nothing from them. So while I stand behind my opinion of the actual device I received, I do not condone companies taking advantage of their customers and I do not recommend you purchase this product. TL:DR - Rite Company is shady, don’t buy this product from them. Apparently, I’m not alone in my hatred for the clean up process of the French press. Since I started investigating solutions to this clearly first-world problem, I’ve come across some pretty solid options. 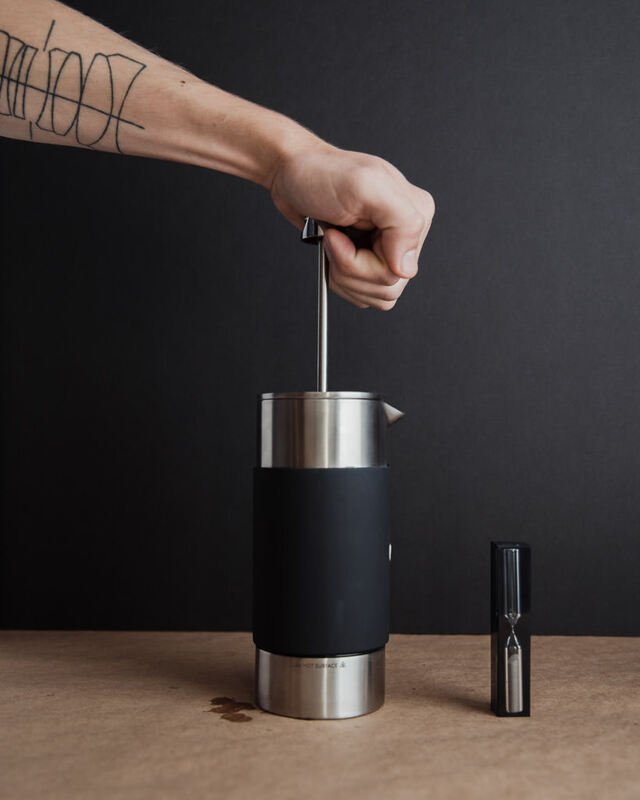 First, I found the revolutionary American Press that takes the French press concept, flips it on it’s head, and elevates it to a completely new kind of brewing. 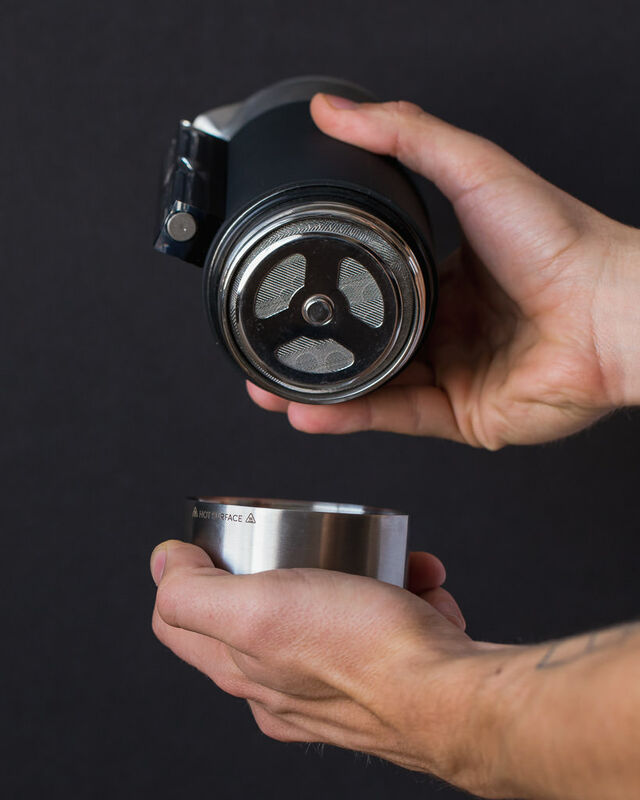 But what if the solution to an easier to clean French press is even simpler than that? 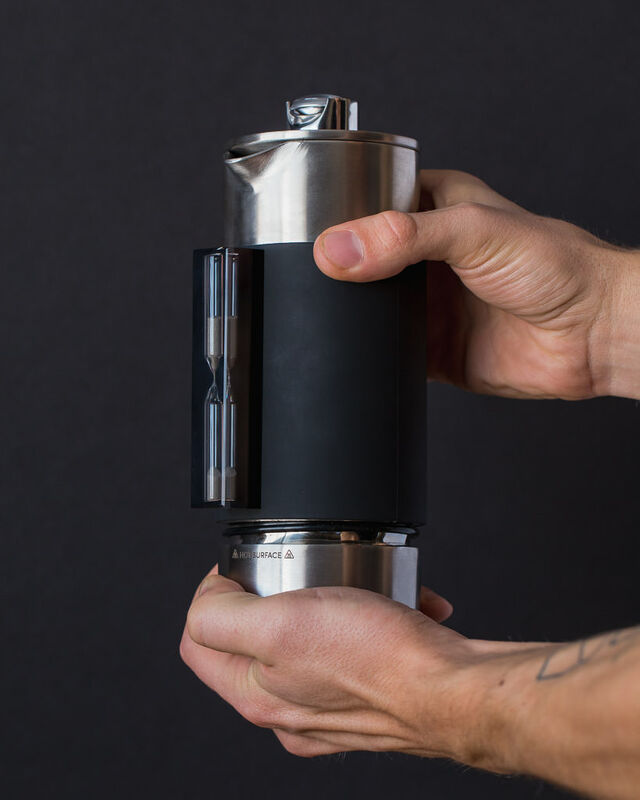 The guys at Rite Press definitely thought so, and released a sort of French Press 2.0 and this time, without the mess. Full disclosure: Rite Company sent me this pre-production press for free to try out in exchange for an honest review. Let’s start with first impressions. The Rite Press arrives in a sleek black box with a minimal branding. The Press and the hourglass timer each come enclosed in their own fabric drawstring bag. I received the Silver 1/2 Liter version. Like the packaging, the press has a sleek and minimal aesthetic. 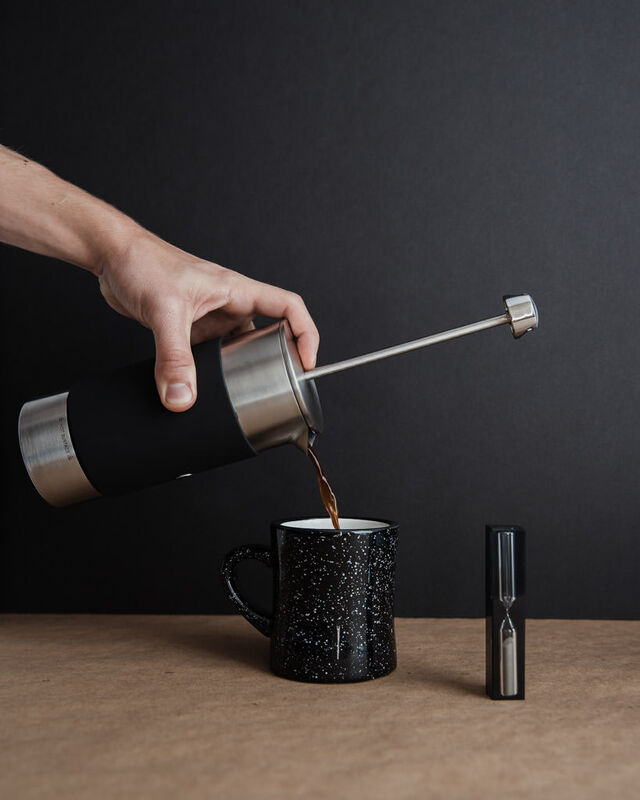 The brushed stainless steel body contrasts nicely with the black silicone grip, creating a silhouette that will pair nicely with pretty much any modern kitchen design. 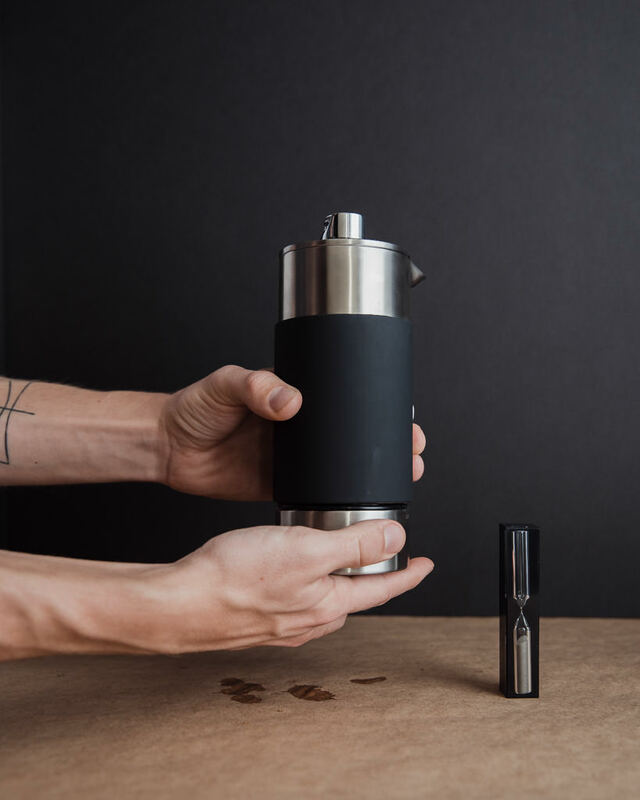 I appreciate the effort to create a self-contained french press without sacrificing aesthetics, the included thermometer and hourglass timer were thoughtful additions. TLDR: the Rite Press is pretty, but does it get the job done? 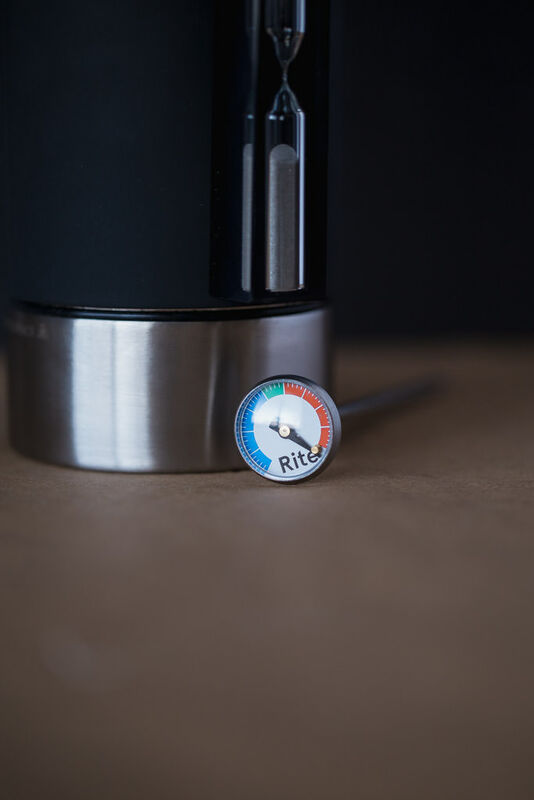 At its core, the Rite press promises to give you the french press coffee you love without all the mess, and it delivers on that promise. The silicone ring sealed base has no issues keeping all the liquid perfectly contained during the brew process. When you’re ready to clean, simply unscrew the bottom and knock the grounds out into a receptacle of your choosing. This simple addition easily elevates the french press brewing experience into something far less frustrating for me. If you’re the person who loves the density and texture of French Press coffee, you really ought to stop and consider the Rite Press. When using the classic recipe, it delivers perfectly without any complaints. The double walled metal keep the bottom from burning your hand, even right after brewing. If you’re like me and prefer a cleaner cup, be aware that the long steep method doesn’t work as flawlessly. The narrow body of the 1/2 Liter model I have made removing the crust really difficult. The thermometer and hourglass make the Rite press self contained and easily packable. Thanks to the durable stainless steel construction, it could make for a great camping companion. Neither of the additions require electricity so you can still make coffee without using up your precious phone battery. The biggest con in my opinion boils down to price. When the Rite Press officially goes to market, the Silver 1/2 Liter version will retail for $99. Compared to the current market of French Presses, that’s quite the jump. If you want to scale up the 1 Liter, you’re looking at $129 for the Sliver and $145 for the Black. If you make a lot of French press coffee, maybe you can justify the price. Considering my overall opinion of French press coffee, I just couldn’t spend that much. If I’m going to be really picky, I’d point out the clear flaws in machining visible along the edges. However, since I received a pre-production model, I’ll go ahead and give them an optimistic pass. I sincerely hope when the retail models will receive the precision machining I’d expect from a luxury priced product like this. For anyone interested in the Rite Press, I highly recommend you head over to their Kickstarter where you can snag yourself one for up to 80% off the retail price. Thanks for reading! If you have comments, questions or ideas for future content leave a comment below, shoot me an email, or reach out over Instagram!